The disability and community care sector is one of the fastest growing sectors in the country, so it’s a great time for your students to consider a care career. If your students are keen to learn more about working in the sector, carecareers’ online Disability Induction Program is a great place to start. This induction program gives students an understanding of the work we do; the rewards as well as the challenges. By the end of the program your students will have comprehensive, practical knowledge they can apply to working with people with disability. They’ll also receive a certificate for each module they complete. A perfect addition to their resumes. 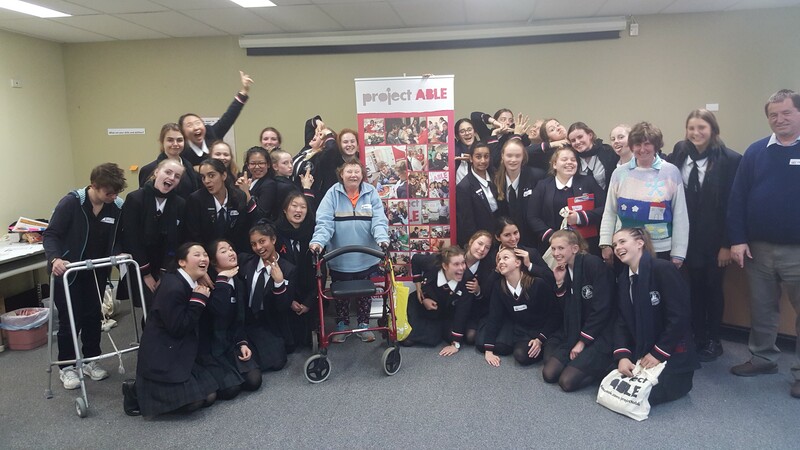 As another school term draws to a close, we would like to thank the over 350 students from across NSW who attended a projectABLE workshop in Term 3. 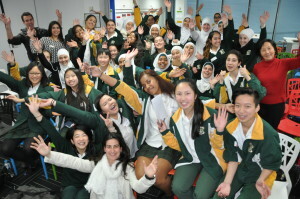 One such school group was Sutherland Shire Christian School (SSCS). The article below by Katelyn Anderson (Year 10) was first featured in their school newsletter. 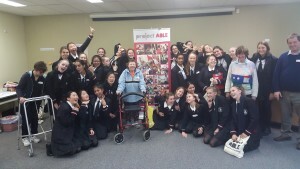 Pictures are from some of Term 3’s newest projectABLE alumni. 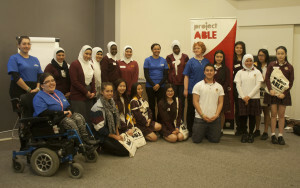 On the 6 August seven year 10 students had the privilege of travelling to Northcott in Parramatta to take part in a program called projectABLE. 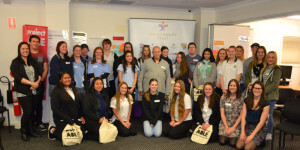 This program informs students about careers in the disability sector and gives a better understanding of what it is like living with a disability. This program was not only informative but interactive. We participated in activities that would help us better understand the difficulties of living with a particular disability such as having a visual or hearing impairment. Some of the activities included learning sign language, describing to a partner a shape for them to draw without them seeing it and relying only on the feel of an item to guess what it is. One of the most beneficial and amazing parts of the day was talking to two ladies, Shirley aged 26 and Olivia aged 20; both born with a disability. 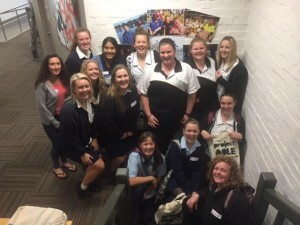 These ladies work part time for Northcott and we had the pleasure to talk with them about their life growing up with a disability, the challenges they have faced and what they like to do for activities. Shirley who has cerebral palsy communicated to us in an amazing way; she is unable to speak and so she spells out sentences using a tablet and one of her knuckles. It was an amazing day! ITS NOT OVER YET! projectABLE workshops are continuing in Term 4. My name is Alison O’Toole. I am a Regional Manager with Lifestart. 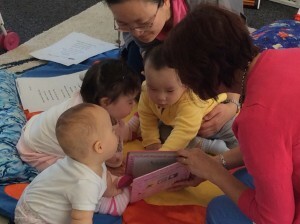 Life Start supports children and young people with a disability or developmental delay as well as their families and carers. I’ve been in this role for nearly two years. Before this I worked for 9 years in different places around the world as an Occupational Therapist (OT). I knew I wanted to be an OT in year 9. I did my work experience with an OT working with children with cerebral palsy. The experience really stuck with me. The OT there was doing simple but effective work with the children in a preschool setting. I was really inspired. As an OT you look at all the little things we do throughout our day that fulfil us. It could be socialising. It could be physically how we perform certain tasks- tying shoelaces, feeding oneself, hygiene related skills. 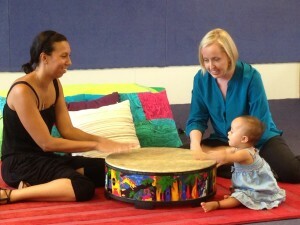 Or it could be the more foundational areas of development such as concentration, attention and self-regulation. How we stay organised in different environments. These are some of the things areas that an OT would look at. Being an OT took me both overseas and to outback Australia. I worked in the UK and Canada in the disability sector before returning to Australia and working in Outback NSW and Sydney. I have supported children with learning difficulties and disabilities in a range of different settings. I’ve always been really passionate about social inclusion; I believe that everyone has a place in our community and should feel valued. I also believe that everyone should have a place in their local school. The role of early intervention is to ensure children with a disability and their families believe this is possible, and the right supports are put in place to ensure they are able to participate in their community. A lot of opportunities are opened up when you use a strength based approach and empower the child and family. The work that I do with families tends to be long term which means that you develop strong relationships with families and are part of their journey.This has really resonated with me on an emotional level. Also, every child is different. Every family situation is different and unique. So every day of work is so completely different and that’s so exciting and stimulating. Working with children is important because in those early years children are still developing their sense of self, who they are in the world. And obviously the amount of learning that happens in those early years is massive. 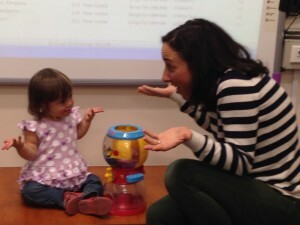 So much learning and development comes through play, so an important part of the role of an OT is using a play based approach to skill development. There’s a lot of intense wiring happening in the brain in those early years and when you’re able to support a child’s development at this stage it can have a huge impact. Most importantly, you’re connecting with the child’s sense of self, their belief in themselves and their place in the world. Who they are as a learner, a peer, a friend, a son or daughter. To illustrate, I worked with a little boy in a remote outback community who had so many strengths and was just this amazingly social child. However, he found it really hard to stay organised in some environments. This resulted in a lot of anti-social behaviours. His placement at the school was in jeopardy but the nearest school was nearly 100kms away. This was enormously stressful for the family and the school. I was able to work with the child, teacher, school and family, to bring everyone together and find ways to support him at school. Everyone gained a better understanding of the boy and what he needed to be successful at school. I also worked directly with the boy and his peers around appropriate ways to engage with each other. It made such a big difference to the school, the family and of course the child. If someone wanted to work with children in the disability sector I would say this. No two children are the same so no two days will ever be the same. But the opportunity to make a meaningful contribution, to change a person’s life, their family and community, makes the sector such a satisfying place to work in because you know you’re making a real difference. WANT TO MAKE A DIFFERENCE IN THE LIVES OF CHILDREN AND THEIR FAMILIES? START WITH A PROJECT-ABLE WORKSHOP. WORKSHOPS ARE AVAILABLE THROUGHOUT TERM 3. Take the carecareers' fun career quiz to find out what your ideal job might be.